Sunil Chhetri is also the third on the list of highest active goal scorers with 59 goals to his name, surpassed only by Portugal's Cristiano Ronaldo and Argentina's Lionel Messi. Whether one loves cricket or hates it, they must have time and again found themselves saying, "If only half of these resources were put in other sports in India." However, that's the extent of empathy anyone is willing to show. Come match day, cricket would witness stadium-full of passionate fans, while other sports would go unnoticed. So, after playing match after match to empty stadiums, current football captain, Sunil Chhetri, pled to fans of the sport to come and at least watch them play following which tickets for the game sold out. In an impassioned plea, Chhetri said, "Abuse us, criticise us but please come to watch the Indian national team play." "To everyone who is not a football fan, please come and watch us for two reasons. No. 1 - it's the best game in the world and No. 2 - we play for our country. We will make sure that once you come to watch us, you will not return the same person back home," he said. Chhetri who will be playing his 100th international game for India scored a hat-trick in the first match of the International Cup securing a 5-0 win against Chinese Teipei. However, only 2,569 fans showed up to witness India's momentous win. 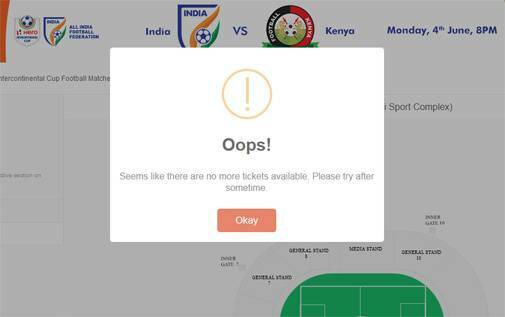 His plea, on the other hand, made sure that the 10-15,000 seats at the Mumbai Football Arena were all sold out for India's second match with Kenya. The captain is also the third on the list of highest active goal scorers with 59 goals to his name, surpassed only by Portugal's Cristiano Ronaldo and Argentina's Lionel Messi. Once the video hit social media, cricketers and celebrities alike urged fans to support the Indian team. Sachin Tendulkar said that our athletes go through rigorous training to represent the country and bring laurels and we must all stand behind and support our teams. Virat Kohli said that anyone who loves any kind of sport should go to the stadium and support the Indian team, who have gotten so much better at their game over the last few seasons. While Chhetri said that the level of game on offer at the Mumbai stadium might not be in the same level - "not even close" - with European leagues, it must be mentioned that the Indian men's football team has had a turn in their fortunes of late and currently rank 97th. After today's match with Kenya, India will face New Zealand on June 7.